C.1914, Ansonia Clock Co., "Cabinet No. 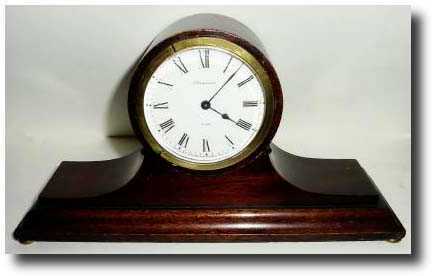 42" Tambour clock The brass bezel surrounding the front glass is split in two places. The case is good original condition with minor nicks and scrapes. The clock has a bright porcelain dial, but with some hairlines. Refer to Ly Ansonia book, no. 1673; value if excellent $125. Running. Height 6"